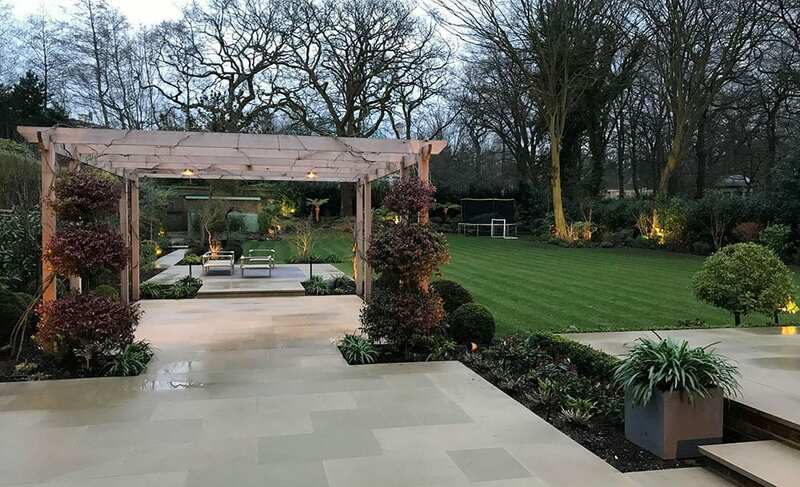 Working with skilled landscaper, Mark Enright, we created a stunning lightscape in Mr Evans' North London home in January 2018. 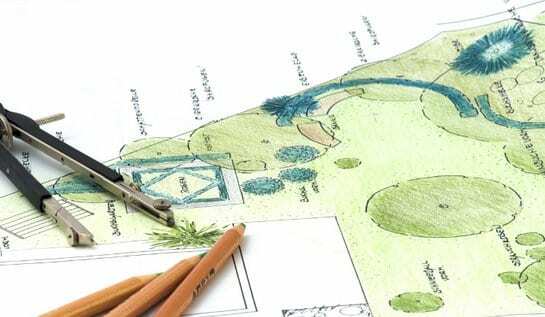 Effective landscaping can completely transform a garden, as Mark Enright demonstrated when he got to work on Adam Evans’ home earlier this year. The garden became an extension of his home, and that was in no small part down to the use of light. The garden had a television room at the bottom which saw frequent use on an evening, as well as a pagoda that doubled up as a hosting area for guests. 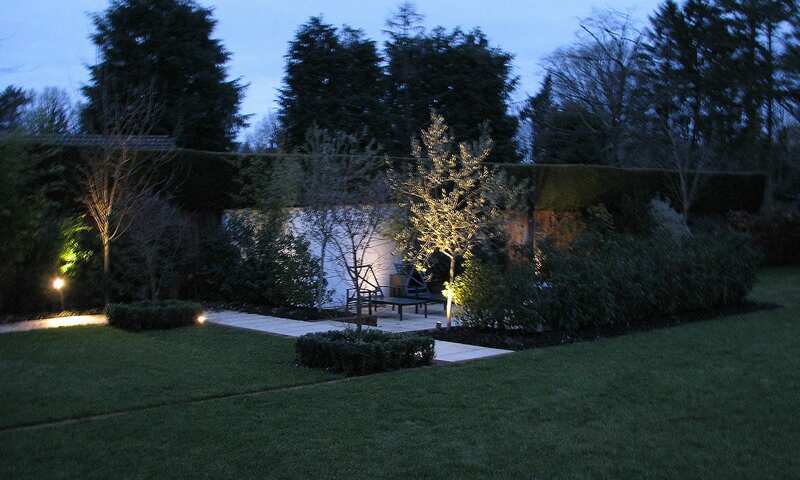 Carefully chosen plants and trees were planted as features which needed to be subtly lit, and there were also steps leading down from the property that needed to be safely visible without disrupting the aesthetic of the garden. All of this lighting needed to be controlled remotely, along with the ability to schedule certain lights to come on at certain times to get the desired effect. This was our challenge. We ran a 5-core armoured cable around the garden with multiple switch lines across 3 separate circuits. This was to enable different configurations of lights to be activated at specified times, instead of a basic ‘on/off’ system. The first circuit controlled the LED floodlights at the base of the trees, while the second circuit focused on the more general lighting that illuminated the smaller trees and bushes. The third circuit was dedicated to the oak pagoda, barbecue and patio area. Not only does this afford Mr Evans full control over his lighting configuration, but we also made sure the mains board had a smartphone connection. 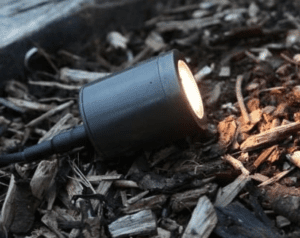 That means that the lighting levels can be controlled from the comfort of a phone or tablet from anywhere in the home – perfect when entertaining guests or preparing to go outside. The software used to manage the lights can also set the lights to run on a schedule which can be easily customised depending on the time of year (with the default being automatic lighting from dusk until dawn). The walkways were carefully lit for safe access to the television room at the base of the garden, and we also took care to illuminate the access steps for safety as well as ambience. 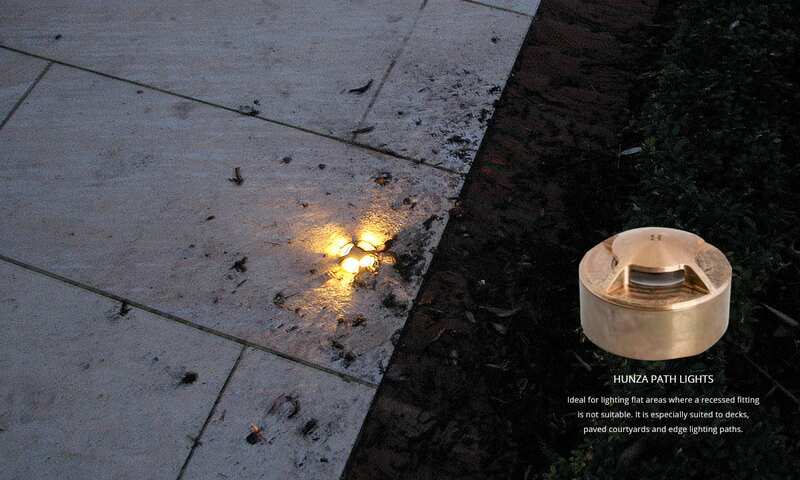 All lights were HUNZA low voltage LEDs, perfect for long-life landscape lighting with an extended warranty of up to 8 years. 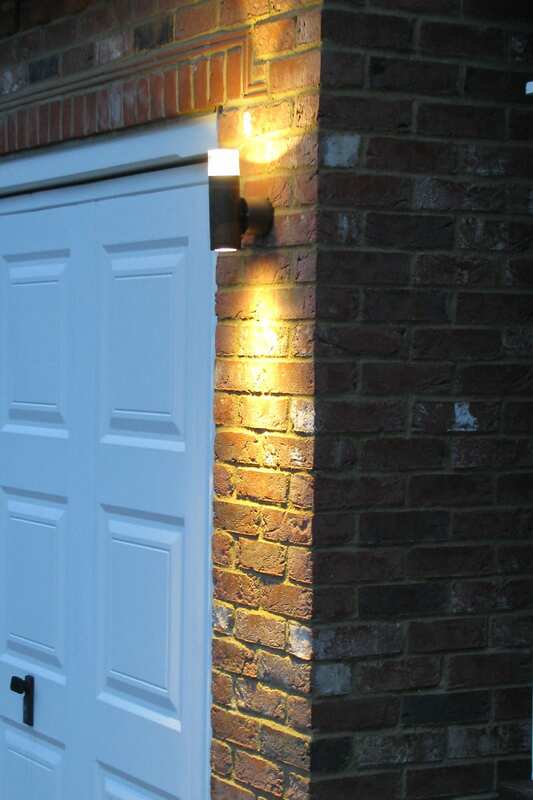 Every single light we installed at the property is also fully serviceable, meaning that if anything did go wrong years down the line it could be easily fixed during one of our annual service visits – something we commit to on every project. Our team’s hard work paid off. 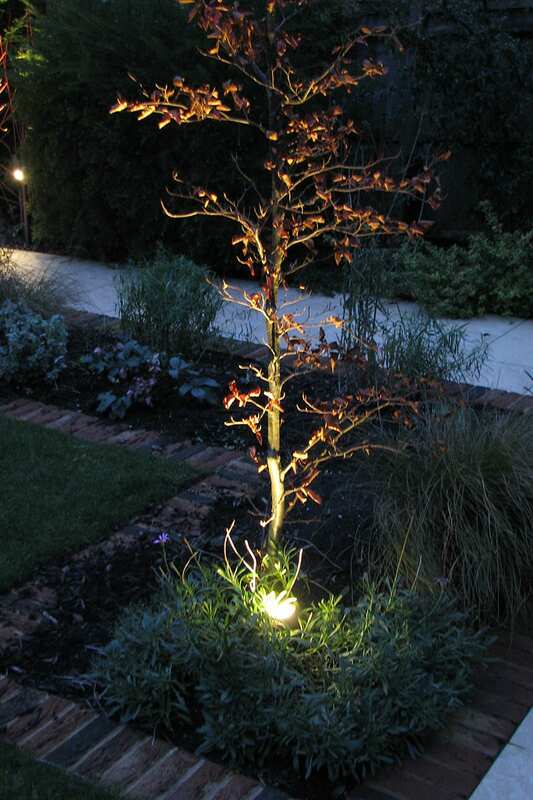 This spacious North London garden is now beautifully lit with dynamic and adaptive lighting technology. All walkways can be used safely, and the garden functions as a welcoming extension of the home for family and friends during the summer months. We’ve committed to visiting the property annually in order to carry out routine checks and make sure everything is running like new, and we look forward to seeing Mr Evans again soon. View some of the projects we’ve been working on lately and hear what our customers have to say about working with us.